Last week I went to a board game night at one of my local comic and game shops, The Hairy Tarantula (West). I ended up playing three games that night and thought I'd give a brief mention of each. The store has been reorganized a bit since the last time I was there, with a few tables in the middle to allow some gaming. I had visited in the afternoon, and the staff there invited me to the evening of games. When we came back that night, there was already of a game Unspeakable Words in progress, so we made do with an opened two player game, Odin's Ravens, until we could be dealt into the next round. When that was over, me moved on the the excellent, Last Night On Earth. So Odin has two ravens and everyday they race. This game is a series of races, with the victor scoring points and the game ending when one player gets to 12 points at the end of the race. A row of 6 land cards are dealt across between the two players, and the ravens start at one end. To move to the next card, a player must play a matching land card from his hand. Your hand is 5 cards, and you draw back up every turn. You can also store cards in an auxiliary stack but have to use cards from that stack in order from top card down (FILO). First player to the end scores points equal to how far behind the other player is. 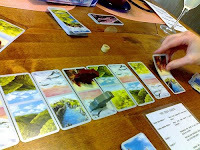 The path can be increased during play, and there are "Odin" cards that can do odd things like block a player, reorganized the land route, that sort of thing. There is also the "Magic Way" which is a side pile you can ditch cards into and possibly score a few bonus points. The game was fun, but not quite my type. There's definitely a bit of strategy, but not a huge amount. Labeled ages 10+, I figure someone younger than me would get more of a kick out of it. 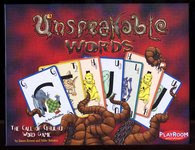 Next, with the previous game finished, we got dealt into a game of Unspeakable Words, a Call of Cthulhu scrabble card game. Each card has a letter and point value. You hold 7 of them, and must play them to make a word, drawing back up to 7 cards afterwards. Pretty much like scrabble without a board and the letter or word bonus squares. However, as this is Call of Cthulhu, there's got to be some sort of insanity inducing catch. Well, for every word you spell, you must roll higher on a d20 than the number of points you score on the word. You get the points for the word whether you're successful or not, but if you fail, you lose a point of sanity. Lose 5 points, and you're out of the game, having been driven mad by the unspeakable words. I lost quite badly, having only been able to make 2 of my roles, so I lasted only 7 words. I admittedly did a few 14 point words, so failing was understandable, but I didn't even manage to make the rolls on several 6 or 7 point words. It was a fun game though, and I highly recommend playing it sometime if you get a chance. I don't know how great the replay is though, as I can see it getting a little old after a while, so I probably won't purchase it myself. Still, a very fun diversion. 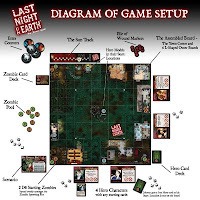 With that game lost, I moved on to the zombie survival game, Last Night On Earth from Flying Frog Porductions. Now, I've played Zombies!! !, but I feel that this game does it better, and it's just packed with options. The map is a random setup with various buildings from the town including: the high school, the hospital, the police station, gun shop, a mansion, and many others. There are 8 characters, 4 of which will play, with 1 or 2 zombie players. The object of the game is for the townsfolk to last the night (20 turns), or for the zombies to eat them. Fair enough. There are also advanced game rules and scenarios that create differences from the basic game. There are event cards for both the townsfolk heroes and the zombies, and equipment to be found in buildings like: pistols, shotguns, meat cleavers, gasoline cans, lighters, first aid kits, etc. While a townsfolk with a weapon definitely has an edge over a single zombie, there are 14 zombies on the board, and they will respawn in various places. Also, many of the zombie actions cards can give a combat bonus, a burst of speed, curse a hero, and other deadly events. Everyone had a lot of fun, and the trash talking zombie players had us pretty nervous for most of the game. Now, as this was the first time any of us had played, we weren't 100% on the rules and made one biggish mistake. I, with several items in my hand, asked how much my character could carry. A quick glace at the rules from the game's owner didn't find anything, so he said unlimited equipment in play. For future reference, the limit is 4 items, and its on page 12. Anyhow, that meant that we were all decked out with gear, and burning through the hero deck pretty quickly. It didn't really change my actions much, as the only gear I used throughout the game were the cards I started with (my trusty pistol killed quite a few zeds and never ran out of ammo), however a few of the other heroes, without trusty guns and lucky ammo rolls, were just lobbing stuff at the zombies left right and center, and we began to feel fairly unthreatened by the end due to our unlimited supplies, and some poor decisions on the zombie players side. That being said, the zombies won in the end by playing a card that discarded the last few cards of our deck, forcing a zombie win, even though most of us were unhurt (which the Hero players felt to be a lame win). As for the game, I was Sheriff Anderson (who starts play with a gun! Awesome! ), and as the police station wasn't in play, I started in the center of town with Jenny the farm girl (the farmhouse also not being in play) surrounded by zombies. We decided to make a run for the high school, as there were fewer zeds on that side of the map, and my son started over there. This unfortunately left nurse Becky to fend for herself in the hospital, and it looked touch and go there for her for the first few turns. Anyhow, we cleared out the school, and began scavenging for stuff while Becky made her way across town. From the windows and roof of the school, we sniped down the zombies pursuing her, but she didn't join us, telling us that our idea of sticking together and holding out in the school was a death trap idea. But the zombie players seemed to be taking there sweet time in coming for us, so I stayed in the school with my son and we pretty much shot down anything that came our way. Jenny hung out for a while, but getting bored ran out with her chainsaw seeking combat. That’s where things were at when that zombie card finished the game. 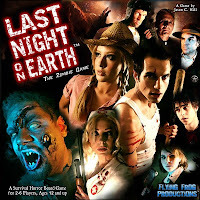 As you can probably tell from the length of this post as compared to the other two games, I really loved Last Night On Earth. Good game and it definitely puts the fear into the hero players as long as they're following the equipment rules properly. The zombie players, despite their lack of brain eating success, also had a great time, pretty much oow-ing, ahh-ing, and maniacally laughing at every card they drew and talking a lot of trash. I plan on buying it myself sometime. At the Korean supermarket the other day, I saw this bag of chips and it's potato chip mascot. Found the image amusing, so I snapped a photo. I don't know if he's waving a finger at me warning of the lack of any nutritional value within the bag, or if he's saying something like, "Oh, you know you want to purchase my intense BBQ flavour." Regardless, with the pageant sash, it's clear he's been crowned, "Mr. Potato Chip World 2008." My internet switches over in a couple of days from Sympatico to TekSavvy, hopefully no issues will come, but I wouldn't be surprised if there's something. I don't trust Bell to figure out that they should stop billing me. I just happened to be coming home early from school today because my Wednesday group meeting got cancelled for the week, and noticed a number people in my neighbourhood on bikes laden with LCBO bags. Today is recycling day in my neighbourhood, and it appears that on recycling day, between 10-12, there are quite a few people going around houses and collecting the wine and beer bottles that have been put out for the deposit you can get at the beer store. On the short walk from the subway to my house, I saw 4 bikes pass, each with attached baskets of bottles and at least 3 LCBO bags tied to the handlebars. On my street, I passed by a man rooting through my neighbour’s recycling bin and pulling out two wine bottles. Now, I knew people did this, I mean, it's easy money if your broke, but I didn't realize just how many people in just one neighbourhood did. I'm also surprised a bit by the number of people who don't return their own empties for the change. I mean, I know it's not much, but since I'm going to go to the Beer store anyway, I might as well carry a few empties and save the $2. I'm just going to make a quick mention of Opera. This is an awesome and under-utilized web browser. I've been maing more use of it lately, and it's just nice to use. It's got tabs that are fast loading. It remembers what pages I was on after restarting. It actually displays pages correctly. Seriously, this thing actually works. 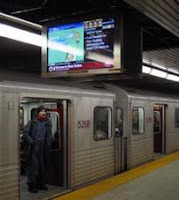 You see, I recently had a few run ins with IE over some css, I got annoyed. Firefox also often points out it's issues to me. So, I've been using Opera. Not for everything. Clearly Firefox has a lot going for it considering all the web developer extensions. But I'll see where I go with Opera. So, we got another major snow storm over the weekend. March?! 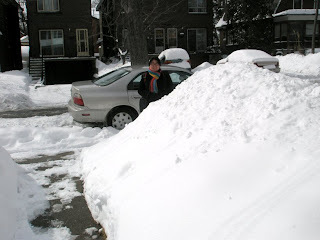 We usually loose all our snow by mid-February in Toronto nowadays. It's quite impressive. We've almost beat the record for Toronto snow fall set in 1939. In fact, as there is some amount of snow due at the end of the week, so we may beat it yet, though I think it's unlikely. So, most people I've talked to are definitely ready for the winter to end. Most are very tired of shoveling. Me? I'm loving it. There has been a distinct lack of snow for most of the past few winters, and I like snow, so this has been nice. I don't even really mind shoveling too much either. 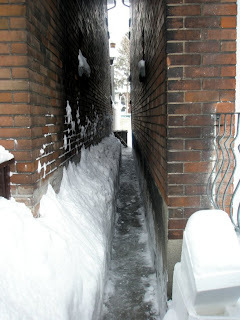 Some would say that that's because I have no driveway to shovel (well, we have one in the back, but no cars to use it, so…), but then again, I have a very long house with a narrow walkway along the side which needs clearing, so I think that's just as bad. After this storm, I had quite the digging job to cut a path through. The front yard is starting to get amusing too, as the piles are getting large enough that I don't know where I’ll put any more snow if it comes. The snow pile out front. And another snow covered day begins. Now in March! This has been quite the winter. I've heard the news that Gary Gygax, one of the creators of D&D, and founder of TSR, died this morning. I have nothing very deep to say on this. I feel that many other blogs have said much more than I could. The Wizards of The Coast D&D site has an obituary on it's welcome page. Paizo's Blog has a post from their head publisher remembering him. Kenzer and Company has posted their "Eulogy for a Gamer" on their site as well. No doubt countless other sites and blogs across the net have also made posts, comments, etc. For me, I will say that he did not simply create a game and found a company, but helped start a whole genre in gaming that has survived, grown, and created new genres itself. Without D&D, there would be no other role-playing games, likely no collectable card games, and no World of Warcraft. But more than just a genre, it kicked off a whole community of gamers of all ages. One thing I don't often think of from my past days of working in a comic book and gaming store, is just how wide a range of people came in who played RPGs. No posts for a week or so. It's been pretty busy. I pulled several day-long coding marathons in the labs with my team getting my latest compiler assignment done. But oh well. Today though was the first day at my new office, the company I work for having moved over this past weekend. Hopefully the roof of this new building won't leak when it rains. Hopefully the elevators won't break down once a month stranding people between levels. Hopefully the temperature controls won't have us switching from sweaters to shorts during the course of the day. 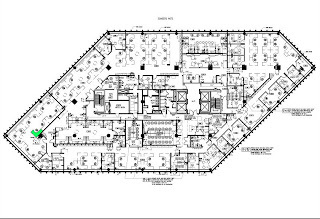 We're in cubicles now though, but that doesn't really affect me too much, as I was sharing an office with two others before, and prior to that, my desk was in the hallway. Plus, the software team has walls separating them from everyone else (so we don't scare away people?). So all in all, not too bad. We also get these nice lock-cabinets for our stuff. Things are still being organized a bit.